Recently a few people have asked me about nutrition for toddlers, do they need different foods (or a different balance of foods) to adults? Obviously babies have all their needs met through breast milk or formula and during weaning they will have a combination of both. But what about toddlers and pre-schoolers, what do they need? Protein is especially important for children since it's needed for both physical and brain growth, so they need a bit more than most adults do. Meats provide a complete protein, but if your family avoids meat you will need to be sure to eat a wide variety of beans, pulses etc to get all the different amino acids needed for growth and repair. This is especially true during growth spurts. Calcium is important for growing strong and healthy bones, and for most families it is found in milk. A child under five needs about a pint of milk a day, but this includes milk in yoghurts, cheese, served on breakfast cereals, mashed into potatoes etc. so they may not need to drink very much at all. Because children need a full fat diet (see energy, below) this should be whole milk until they are at least two. If the child has a good diet they can have semi-skimmed milk after that but it would be preferable to keep to whole milk until they are five. Children who can't drink milk from cows/goats etc should be given breast milk or formula until they are two so that they don't miss out on any of those nutrients. After that there are many vegan sources of calcium, although it's a good idea to take a B12 supplement as well. Children need a lot of calories for energy, both for growth and for all that running about. Most of that energy comes from carbohydrates and fat, if they don't get enough from those sources protein will be used for energy instead of growth. Children need a full fat diet, which means things like whole milk, full fat yoghurts, avocados, oily fish and oil used in normal cooking. It doesn't mean a lot of fried foods and those should be kept to a minimum. If you follow a low fat diet make sure that there are full fat options available for your toddler. Starchy carbohydrates are also important, things like bread, pasta and potatoes. Generally you don't want to offer these in overly large portions as a lot of children will fill up on them and not eat much of anything else. Follow the link to see what a portion size actually is, most parents are very surprised. It's a good idea to include wholegrain versions of these foods, but don't go overboard with fibre. 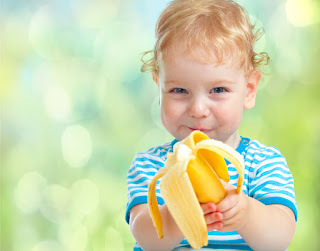 Unlike adults children don't need much fibre and it can fill them up too much and stop them absorbing all the nutrients they need from their other foods. So go ahead and serve wholemeal bread or brown pasta, but keep the bran flakes for adults only. When talking about feeding children the mineral that always gets a mention is salt. The salt that naturally occurs in various foods is fine but avoid adding any salt during cooking or at the table. If adults like extra salt it would be better to add it away from the table so the child doesn't see, since they will inevitably want to copy. Avoid large quantities of high salt foods like bacon, cheese or gravy but a small amount wont do any harm. Other vitamins and minerals are found in fruit and vegetables and it is important to eat a wide variety of those since each one contains different nutrients. As a general guide you will get the widest variety if you eat fruits and vegetables of different colours so try to make sure that your "five a day" aren't all green! Since vitamins can easily be destroyed during cooking it is best to include some raw vegetables as well as the cooked ones. Things like carrot and cucumber sticks make ideal snacks. So, how does this all translate into an actual meal? Lets say you are making spaghetti bolognaise for your family. You might choose to use a mince that has a moderate fat content, perhaps 15%, and include several different vegetables in the sauce. You would serve your child a proportionally bigger helping of sauce compared to the amount of pasta they have and might put some cheese on the top. The meal would be followed by a full fat yoghurt and a piece of fruit. For information on what a portion size looks like this table by the infant and toddler forum is an excellent resource. Since all children are different I would consider these pictures to show a minimum amount, so long as your child eats this much there is no need to encourage them to have more. However some children are growing fast and have big appetites so it's much better to give them larger portions than to restrict their meals and end up giving less healthy snacks later on.